Matterhorn mountain of the Alps on the border between Switzerland and Italy. 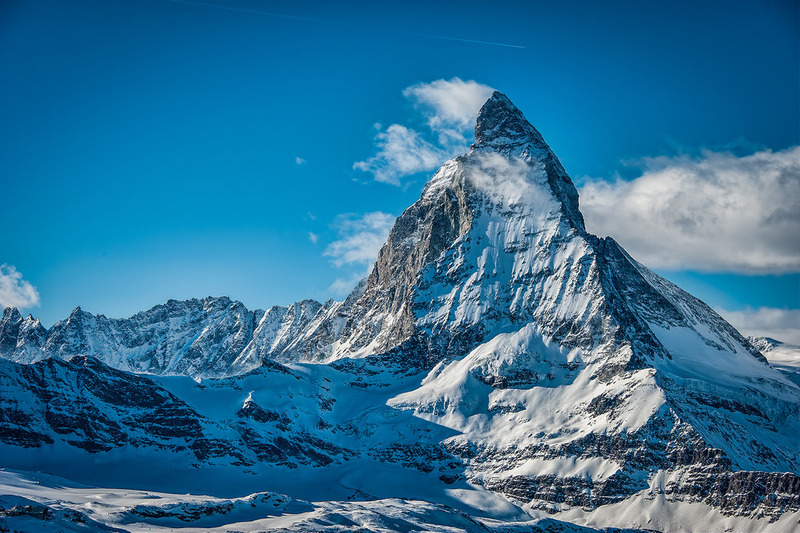 At a height of 4,478 meters, Matterhorn only ranked 6th among the highest mountains in Switzerland and 5th of the 22 over - 4,000 meters high mountains of the Alps. while it has no outstanding high but unique terrain of the mountain made it a symbol of Switzerland. Matterhorn is like a pyramid with four triangular faces meet at the top. The edges of the mountains was skillfully shaped by nature as if it was cut with a knife. All four sides of the mountain are very steep, so very little snow and ice cling to them. The closest town located at the foot of the Matterhorn mountain is Zermatt. From Zermatt you can take a cable car to the Matterhorn. Most of the fascinating tours is from Zermatt to the Matterhorn Glacier Paradise with time estimate of 40-45 minutes. The first stops is Furi at the height of 1867 meters, passes through forests and green pastures outside Zermatt. At Furi, you will switch to a different cable cars, flying through the woods and then glides on a high rocky plateau with undulating mountains, Trockener Steg station with the height of 2,939 meters is enough for guests to admire the majestic Matterhorn mountain panorama. Leaving Trockener Steg, you will come across many other stops to go to the top of Matterhorn: Klein Matterhorn, Breithorn and Theodul. Theodul are snow covered all time in the year. When you come here, you will be surprised to see many people ski even in summer. Klein Matterhorn is the highest cable car in Europe to transport tourists to visit the leading European golf (Glacier Paradise) on top of Klein Matterhorn. Out of the garage door, you will walk through hundreds of metal steps built into the cliff clinging on Klein Matterhorn Glacier Paradise. 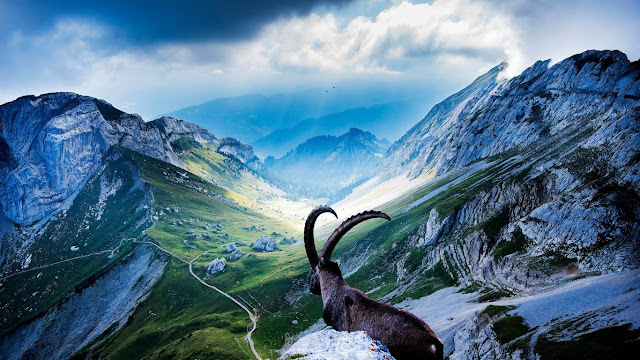 Here, you will get a 360-degree panoramic view of the majestic Alps between Switzerland, Italy and France with a total of 38 peaks at the height of 4,000 meters. You will choke before stunning in front of glaciers and permanent snow here. On sunny days, clear blue sky, standing on the Matterhorn, you can see Mont Blanc at 4810m all year round covered in snow white, the highest peak of the Alps. From atop the Matterhorn, you'll see every corner of the lower town of Zermatt. The ancient wooden house in Zermatt sparkling lights night is just like the scene in the fairy tale. Standard of living in Switzerland is high so it will be difficult for people with limited pocket of money. However, Switzerland has many less expenses campsites that can help you saving, the place is very clean and well-appointed. This camping type not only save your money but also be a great opportunity for you to fully mingle, admire the stunning natural of Switzerland. Silent listening to the murmur of the wind, the sound of gurgling streams, the murmur of the trees and watch the starry sky with the mystery moon, you will have an unforgettable experience in life. The beauty of the three mountain peaks in the Alps in Italy looked as if it had just rising out of the ground, and no other peaks in the surrounding areas. The highest peak is measured 3,000 meters high and was first discovered in 1869. Currently there are few roads leading up the mountain, but be careful when you hire car to self-driving, because the street is pretty winding and narrow, with very few defenses. Kirkjufell located on the northern coast of Snaefellsnes peninsula, in a fishing village called Grundarfjordur. Although only 460 meters high, Kirkjufell is an iconic mountain of Iceland and also it is the mountains that is photographed the most in the country. A 11 hours tour will give you discover panoramic mountain with lava cave, the black pebble beach and Snaefellsjokull volcano. While the name "Ama Dablam" means mother's necklace, this 6848 meter peak located in eastern Nepal is also known as the Matterhorn of the Himalayas and at the third place in the list of the mountains which is visited the most in the area. This is one of the most recognizable peaks in the world. You can come up here by cable car or on foot. From the top of Table Mountain, Cape Town can be seen easily and you can admire the scenery, which, according to those who have traveled around the world, is worthy to be called "invaluable". Also, if you're in the area Boulders, you can catch the penguins. Table Mountain has long been seen as a symbol of the city of Cape Town in particular and the country in South Africa. This special mountain was chosen as the avatar appears on the flag of Cape Town and on the reliefs of the local government. Standing on the top of Table Mountain, visitors will have the chance to have a panoramic view of South Africa after a journey by cable car or climb up the mountain. Let's travel to South Africa travel together to discover the beauty of this wonders of this world! Interesting fact of the name "Table Mountain"
The story explains the name of the mountain which is the symbol of South Africa - Table Mountain is quite diverse. In particular, there is a story that is quite well known in 1503, a Portuguese sailor named Antonio de Saldahan first arrived in this bay. At that time, the South African land remains untouched land and is home to the only local Khoikhoi tribe. Put your foot down this land, the sailor saw a mountain range with strange shaped islands in the Gulf, the sailors immediately exclaimed in Portuguese: "Montanha da Mesa". "Montanha da Mesa" means "Table Mountain". The name sounds strange but very suitable for the actual shape of the mountain with a flat top like a stone table. Therefore, since then, this special mountain people are also known as the "Table Mountain". And since then, the name of the bay is also named after the image associated with Bay Table Mountain. Visitors who join the tour to South Africa can not ignore Table Mountain. Guests can visit Table Mountain by cable car or can climb up the mountain through trails. The most common paths is to go through Platteklip Gorge canyon. This journey takes approximately from 1-3 hours. Table Mountain highlights across the bay in the shape of a sea blue tabletop flat with a length of 3 kilometers and be surrounded by the vertical cliffs. Flat table surface is made up of mountain ranges: the top "Devil" in the east, the mountain "Lion Head" in the west. There is an interesting comparison in Table Mountain image: Overall, Table Mountain is look like a stage. Lion Peak and Devil are 2 wings of the stage, the center of Cape Town and Table Bay serves as a backdrop behind the stage, the hill "Signal" in the front is like a room for audience to watch the stage. Bring inside the unique beauty in both appearance and fauna, Table Mountain deserve to be considered as a world heritage site by UNESCO and this is the pride of the South Africa people. Joining the tour to South Africa and discover the beauty of this famous mountain now! In southern Patagonia, at the border between Argentina and Chile is a mountain with a steep jagged granite with about 1 mile length. Used to be considered as the most difficult mountains to climb on Earth because of the incredibly strong wind, it was conquered for the first time in 1974. You have seen a lot of pictures of Machu Picchu (also known as Old Son or The Lost City of the Incas)? You will notice that behind all the photos is a mountain, that is Huayna Picchu peak. With approximately 2,720 meters high, this is a most suitable place to see the Inca ruins. The government only allows a maximum of 400 visitors per day to visit the mountain and you can also visit the Moon Temple built in a cave along the trail up the mountain. Located outside of the palm trees and tropical flowers of Hawaii's big island is the largest volcano on the planet. Mauna Loa has a lifetime of 700,000 to 1 million years old, its height reaches up to 4,162 meters. The volcano's most recent active period was in 1984 had created huge lava river, threatening the nearby town of Hilo. Famous for its distinct shape, this granite overlooking Yosemite Valley, nearly 2,683 meters above sea level. Visitors can travel by cable car to the trail or up the mountain. The highest mountain peak in North America reached 6,190 meters height. Mount Denali (formerly called Mount McKinley) dominate the skyline of Alaska. 2.43 million hectares around it as wilderness areas and national parks, adding to the available scenic grandeur of Denali.